TORONTO, ON / ACCESSWIRE / November 7, 2018 / Tsodilo Resources Limited (TSX Venture Exchange: TSD) ("Tsodilo" or the "Company") is pleased to announce the results of an independent modelled grade and diamond value for an aggregate 77.94 carat parcel of 502 commercial size (+1mm) diamonds. Which were recovered from Large Diameter Drilling ("LDD") from four kimberlite units of the BK16 kimberlite pipe in the Orapa Kimberlite Field ("OKF"), Botswana. The current LDD sample average price is US$ 176.44 per carat, this is derived from a valuation of three parcels totaling 502 stones (77.940 carats). The modelled average price ranges from a high of US$ 710 to US$ 386 per carat. The five highest diamonds by value ranged from 0.965 carats to 1.935 carats with a total weight of 7.22 carats and have an average price valuation of US$ 612.85 per carat. The modelled average grade ranges from a high of 11 cpht to 8 cpht. 3.8% of the diamonds tested were identified as Type IIa diamonds consisting predominantly of D color stones. Breakage studies indicate that ~70% of the diamonds were unbroken and of those which were broken only 3.2% were heavily broken. The Size Frequency Distribution ("SFD") study demonstrates the presence of large stones, indicating that 8.0% may be greater than 10.8 carats ("specials"), and 0.5% could be greater than 100 carats. The diamond valuation was performed by QTS Kristal Dinamika ("Mr. Ray Ferraris") utilizing the current QTS proprietary Price-Book (Q3-2018). The grade and price modelling were performed by Dr. Lawless of Dr. Paddy Lawless & Associates CC. ("Dr. Lawless"), and uses proprietary modelling techniques, to predict the grade and average price per carat in a mine production scenario. Photos of the diamonds are available at: http://www.tsodiloresources.com/s/Photo_Gallery.asp?ReportID=820507. Dr. Lawless, stated "Based on my analysis of the diamonds, the modelled value of US$ 710 USD to $US 386 per carat and the grade of 8 to 11 cpht are both higher than the sample grade and value of the 2,076.76-dry metric ton LDD sample which represented ~0.01% of the kimberlite body tonnage. The sample grade and value are limited due to the relatively small sample size and hence are is not representative of the entire SFD of the deposit. The lack of large stones in the sample is due to their relatively low probability of occurrence. By using the actual size distribution of the sample (number of stones in each size class) and aligning it with a more complete 'reference SFD', grades and values were adjusted to remove the effects of the small sample size. As such, the modelled grade and value represent more realistic run of mine production. Based on the modelled diamond value and kimberlite grade additional sampling of the kimberlite is required to confirm these positive results and to improve on the diamond value." Dr. Michiel de Wit, Tsodilo's President and COO commented that, "The promising modelled SFD grade and value indicates that BK16 deserves further work because BK16 could also be a high value diamond producer like AK6 (Karowe mine)." Tsodilo has recovered 502 diamonds to date weighing 77.94 carats from 3 parcels of commercial size diamonds (+1 mm) from 2,076.70-dry metric tonnes of LDD samples of the VK2, VK3, VKxxx and CB lithological domains in the BK16 kimberlite pipe. The diamonds were analyzed by Mr. Ferraris and Dr. Lawless at the Diamond Technology Park ("DTP") in Gaborone after deep-cleaning by acid boiling and sized to the +1 DTC sieve classes. Mr. Ferraris determined the current market values for the three LDD parcels. Where Parcel 1 (94 stones, 17.045 carats) gave a value of US$ 195.45; Parcel 2 (130 stones, 17.700 carats) gave a value of US$ 196.37; and Parcel 3 (278 stones, 43.195 carats) gave a value of US$ 161.03. The average current market value of all the diamonds was US$ 176.44 per carat. The five highest individual diamonds constituting more than 4% of the value of the overall parcel ranged in size from 1.935 carats to 0.965 carats, weighed 7.220 carats in total and had an average market value of US$ 612.85 per carat, see Table 1. Table 1. The five highest individual diamonds constituting more than 4% of the value of the overall parcel. The chain of custody has been maintained to industry standards (see previous press releases on the Company's website describing the systems employed to ensure that industry standards were achieved). The diamonds were classified using the Diamond Trading Company ("DTC") mass carater/grainer system for the 6, 5, 4 and 3 grainer size classes and the DTC Diamond Sieves ("DS") for the -3gr+11, -11+09, -09+07, -07+05, -05+03, -03+01 and - 1DS size classes. The masses of all recovered stones were recorded and valued in their respective size classes. The QTS valuation of these LDD diamonds is considerably above the original basis for the historical diamonds recovered in 1999 and 2000 from BK16 which were valued in 2016 at $138 per carat. More than half the diamonds were tested using a Yehunda Z-50 colorimeter where 3.8% of these were positively identified as Type IIa stones. Most of these are D color with one DE, one E and one F+ colors. Type II diamonds are rare diamonds which have no measurable nitrogen levels. Type IIa diamonds are generally devoid of impurities and tend to have a colorless and low to no ultraviolet light fluorescence. Mr. Ferraris of QTS stated that, "The overall parcel is dominated by white, gem-quality diamonds, many of which are G-color or higher. The proportion of low-quality diamonds is very low compared to other Botswana kimberlites. There is a general prevalence towards resorbed dodecahedron shaped diamonds, no boart quality diamonds were seen, and the presence of the high-quality Type IIa diamonds was confirmed." Dr. Lawless determined the modelled prices for the 502 diamonds using statistical methods that can predict the possible proportion and price of each size class of diamonds in potential future run of mine production. The data used for modelling includes SFD data, QTS market prices for each size class, and estimated prices for larger diamonds that would be recovered in a production scenario but were not represented in this small diamond parcel. This method is based on a linear extrapolation (Figure 1) up to and including the 19.8 carat size class. Extrapolating a $/carat value to diamonds beyond the 19.8 carat class size was deemed inappropriate as the link between value and size in these larger class sizes becomes inherently uncertain. The $/carat value of these sizes were therefore limited or "flat lined" to the upper limit value of the >19.8 carat size class value. The values of US$ 710.10 to US$ 386.43 per carat are recommended by Dr. Lawless as more representative of the true run of mine production diamond values that could be expected from BK16 within a large degree of uncertainty due to the nature of this type of modelling on a small parcel like this. This type of price modelling is progressively more uncertain on smaller parcels of diamonds. 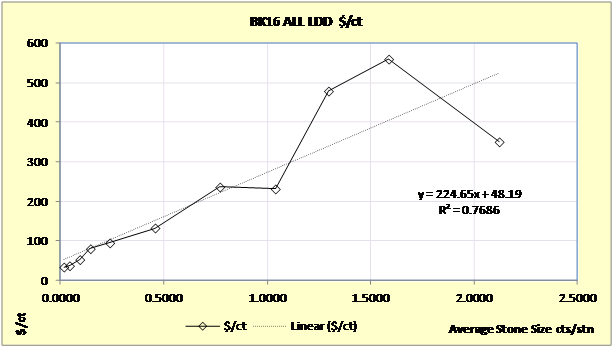 In addition, due to the small size of the parcel, the modeled value is only indicative of future BK16 value and equally important is the fact that the higher average modelled price does not represent a maximum price and that the ultimate diamond price could be higher than US$ 710 per carat depending on quality. To gain more confidence on the value of the diamonds a parcel of at least 500 to 1000 carats are required. to the upper limit of the >19.8 carats size class. Stones per hundred tonnes per Unit Interval (stpht/ui) colloquially known as "SPTUI plots", which plot the log base 10 of stpht/ui against the log base 10 mid-point of the size classes on linear scales. The 'modelling' exercise from the LDD combined data provided from all BK16 kimberlite phases has indicated a best Possible Content Curve SFD deposit caratage of 1,545,930 carats to 2,196,225 carats for the entire Exploration Target tonnage of 18.2 to 20.1 million tonnes for all kimberlite phases to a depth of 450 meters. This implies a possible grade of 10.93 cpht to 8.49 cpht (two decimal places) at a DTC 01DS plate bottom cut-off of 0.82 mm. In practice the lower cut-off at the DMS treatment plant was set at 1.0 mm. Diamond breakage occurs both naturally during diamond emplacement or eruption of the kimberlite, and un-naturally during various processes of extraction, drilling and recovery, commonly referred to as "winning" of the diamond, which create "fresh" breakages. Natural breakages of diamond are subject to chemical attack from the molten kimberlite which would have etched or produced resorbed broken surfaces, making them recognizable as "old" or "natural" breakage. As such only "fresh" or un-natural breakage is contemplated during diamond breakage studies of this type. Diamond breakage studies conducted by Mr. Ferraris, indicated a low level of un-natural or 'fresh' diamond breakages. Most diamonds (69.7%) had zero breakage, and only some stones were chipped (17.5%), and 7.8% classified as lightly broken. Where only 3.2% of the diamonds were classified as heavily broken, and 1.8% were classified as fragments (Table 2). This low level of fresh breakages illustrates the well managed LDD and DMS treatment programs. Table 2. Breakage Classification showing small levels of breakage. The Exploration Target tonnage range of 18.2 to 20.1 million tonnes (Mt) is an update and an increase on the tonnages quoted in the Exploration Target Tonnage press release of July 15, 2015. The increase in volume of all the kimberlite units is due to new drill-hole information from the 14 LDD pilot drill-hole NQ drill core totaling 3,220 meters of drilling, of which 2,801 meters of kimberlite were drilled, see press release of June 26, 2017. The updated BK16 model produced with Gocad 3D software can be viewed at: http://www.tsodiloresources.com/i/pdf/BK16.pdf . The tonnages produced for the BK16 kimberlite units are based on the volumes from updated modelling and an updated set of density core measurements of these two units down to a level of 450 meters below the surface. Where the lower Exploration Target tonnage of 18.2 Mt presented is based on the modelled volume and converted to tonnage using the lower average weathered kimberlite density of 2.29 g/cm3. Likewise, the upper Exploration Target tonnage of 20.1 Mt presented here is based on the modelled volume and converted to tonnage using the higher average fresher kimberlite density of 2.53 g/cm3. Upper = 2,196,225 carats for the 20.1 Mt and 10.93 cpht modelled grade. Lower = 1,545,930 carats for the 18.2 Mt and 8.49 cpht modelled grade. For all kimberlite phases to a depth of 450 m.
Crushing and X-ray treatment through the Bourevestnik Polus-M X-ray unit of the +3 mm concentrate fractions in order to liberate any locked-up diamonds is ongoing and auditing of the BV tailings through a simple grease recovering unit has recently commenced. A second phase of bulk sampling to increase the sample caratage from BK16 is being investigated. This is necessary to improve the confidence limit of the US$ per carat modeled values for feasibility purposes. Several different scenarios are being investigated to recover a minimum of 500 carats either by extending the existing shaft and tunnels or using 24-inch LDD work either as cluster holes or individual holes on a grid system. Canadian National Instrument 43-101 - Standards of Disclosure for Mineral Projects, Form 43-101F1 and Companion Policy 43-101CP requires that the following disclosure be made: All references contained herein with respect to the potential quantity and grade derived by any method is at this stage of development conceptual in nature. At the present time, there has been insufficient exploration to define a mineral resource and it is uncertain if further exploration will result in the target being delineated as a mineral resource. This press release may contain forward-looking statements. All statements, other than statements of historical fact, that address activities, events or developments that the Company believes, expects or anticipates will or may occur in the future (including, without limitation, statements pertaining to the use of proceeds, the impact of strategic partnerships and statements that describe the Company's future plans, objectives or goals) are forward-looking statements. These forward-looking statements reflect the current expectations or beliefs of the Company based on information currently available to the Company. Forward-looking statements are subject to a number of risks and uncertainties that may cause the actual results of the Company to differ materially from those discussed in the forward-looking statements, and even if such actual results are realized or substantially realized, there can be no assurance that they will have the expected consequences to, or effects on the Company. Factors that could cause actual results or events to differ materially from current expectations include, among other things, changes in equity markets, changes in general economic conditions, market volatility, political developments in Botswana and surrounding countries, changes to regulations affecting the Company's activities, uncertainties relating to the availability and costs of financing needed in the future, exploration and development risks, the uncertainties involved in interpreting exploration results and the other risks involved in the mineral exploration business. Any forward-looking statement speaks only as of the date on which it is made and, except as may be required by applicable securities laws, the Company disclaims any intent or obligation to update any forward-looking statement, whether as a result of new information, future events or results or otherwise. Although the Company believes that the assumptions inherent in the forward-looking statements are reasonable, forward-looking statements are not a guarantee of future performance and accordingly undue reliance should not be put on such statements due to the inherent uncertainty therein. Forward-looking statements are subject to a number of risks and uncertainties that may cause the actual results of the Company to differ materially from those discussed in the forward-looking statements and, even if such actual results are realized or substantially realized, there can be no assurance that they will have the expected consequences to, or effects on, the Company. Factors that could cause actual results or events to differ materially from current expectations include, among other things, uncertainties relating to availability and cost of funds, timing and content of work programs, results of exploration activities, interpretation of drilling results and other geological data, risks relating to variations in the diamond grade and kimberlite lithologies; variations in rates of recovery and breakage; estimates of grade and quality of diamonds, variations in diamond valuations and future diamond prices; the state of world diamond markets, reliability of mineral property titles, changes to regulations affecting the Company's activities, delays in obtaining or failure to obtain required project approvals, operational and infrastructure risk and other risks involved in the diamond exploration and development business. Any forward-looking statement speaks only as of the date on which it is made and, except as may be required by applicable securities laws, the Company disclaims any intent or obligation to update any forward-looking statement, whether as a result of new information, future events or results or otherwise. Although the Company believes that the assumptions inherent in the forward-looking statements are reasonable, forward-looking statements are not a guarantee of future performance and accordingly undue reliance should not be put on such statements due to their inherent uncertainty. Neither the TSX Venture Exchange ("TSXV") nor its Regulation Services Provider (as that term is defined in the policies of the TSXV) accepts responsibility for the adequacy or accuracy of this news release. This news release may contain assumptions, estimates, and other forward-looking statements regarding future events. Such forward-looking statements involve inherent risks and uncertainties and are subject to factors, many of which are beyond the Company's control, which may cause actual results or performance to differ materially from those currently anticipated in such statements.